Congress itself was responsible for the delay. As part of the basic Mint Act of April 2, 1792, the House and Senate specified that two key Mint officers, the chief coiner and assayer, would have to post bonds of $10,000 each before they could work with precious metal. The requirement was onerous: It represented more than six times the annual salary of $1,500 apiece provided for these two officers. Understandably, they had trouble meeting it and, until they did, only copper coinage could proceed. Frustrated by this roadblock in his efforts to begin full-scale coinage, Mint Director David Rittenhouse appealed for help to Secretary of State Thomas Jefferson, the Cabinet officer then in charge of the Mint. Jefferson succeeded in getting Congress to lower the bonds to $5,000 for Chief Coiner Henry Voigt and $1,000 for Assayer Albion Cox; they then put up the money and the Mint was free at last to produce the remaining denominations. By then it was March of 1794, and the red tape had cost the Mint an entire production year of precious-metal coinage: The only coins issued in 1793 had been copper cents and half cents. (Although the Mint was established in 1792 and it struck some coins that year, all are viewed as patterns rather than official federal issues.) 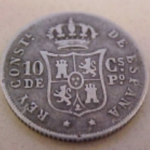 Silver coinage started in 1794 with two denominations the dollar and half dollar; both were identical in design (half dimes of this date were coined the following year). The dollar was deemed the most prestigious, so Mint officials decided to strike that first. Actually, the Mint had gotten a running start on the new coins: Engraver Robert Scot had been told to prepare designs for them months before the legal snarl was untangled. 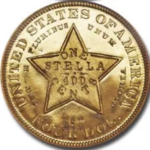 Congress had specified that the new coins should bear a design “emblematic of Liberty,” and Scot accomplished this with a right-facing portrait of a youthful female figure whose hair flowed freely behind her hence the descriptive term “Flowing Hair.” The word LIBERTY appears above her, with the date below and 15 stars along the sides, symbolizing the number of states in the Union at that time. Scot is said to have meant the flowing hair to signify freedom. A pattern 25-cent piece of 1792 served as Scot’s model for the obverse; this had been designed by Joseph Wright, who died of yellow fever in 1793 after serving briefly as Mint engraver. The dollar’s reverse depicts a small, spread-winged eagle perched upon a rock and surrounded by laurel branches. Encircling this, along the border, is the motto UNITED STATES OF AMERICA. 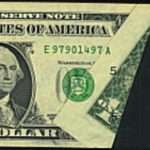 The dollar’s “third side,” the edge, carries the inscription HUNDRED CENTS ONE DOLLAR OR UNIT, with decorations separating the words. The Flowing Hair dollar is slightly larger and heavier than later U.S. cartwheels like the Morgan and Peace dollars. Its authorized fineness differs, too, but its actual fineness doesn’t, because of some curious doings at the Mint. Congress had specified a peculiar alloy of 1485/1664 silver and 179/1664 copper, for a fineness of .8924+. But Assayer Cox complained that this was too difficult to achieve and, what’s more, that silver coins would turn black in ordinary use unless they were at least .900 fine. He prevailed on Rittenhouse to let him use that higher standard, even though Congress hadn’t sanctioned it, creating an incredible situation where the Mint was actually breaking the law of the land. 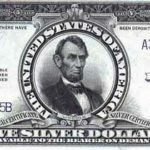 This led to substantial losses for people who deposited silver bullion with the Mint and took silver dollars in return, for they were being forced to furnish more silver per coin than the law required. Eventually, some sought and obtained reimbursement. It’s believed that the Mint struck a total of 2,000 1794 Flowing Hair dollars, all from a single pair of dies. Evidently, some were rejected as being excessively weak and may have ended up being used as coin blanks the following year or simply being melted. The accepted net mintage is 1,758, with estimates of about 120-130 survivors, in all grades. The entire production occurred on a single day, October 15, and Voight stored many of the coins in the Mint’s vaults, giving them to Rittenhouse the following May. The Director presented a few of the dollars to VIPs as souvenirs and also made a point of spending some (or exchanging them for Spanish dollars) in order to get the coins before the public. Rittenhouse never distributed all the coins, however, resigning due to failing health in June of 1795. 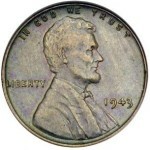 This set the stage for a very interesting piece of numismatic history. Almost 170 years later, in 1964, a small box of “strange” coins was consigned to a Christies auction in London by the family of British nobleman Major Sir Roland Denys Guy Winn, M.C., Fourth Baron St. Oswald. The box contained about $10 in face value of new U.S. coins, dated either 1794 or 1795. Most notable of these pieces were two uncirculated 1794 dollars which brought $11,400 each at the sale. When the coins returned to the United States, the excitement generated among American collectors began to take on a life of its own. A story took root that had one of Lord St. Oswald’s ancestors traveling to Philadelphia in 1795 and receiving the coins directly from Henry DeSaussure, Rittenhouse’s successor as Mint Director. While this account makes fascinating reading and has been accepted as fact for over thirty years, recent research has uncovered that it’s based entirely on conjecture. No family records or accounts support the proposition of a trip to the United States by a St. Oswald ancestor; in fact, they tend to refute it. We don’t know for certain how the coins were obtained or by whom, only that they were in the St. Oswald family’s possession in 1964. Perhaps a future numismatic researcher will be able to unravel this mystery.Further dollar production was suspended until a new press capable of imparting fuller, stronger strikes could be installed. It didn’t resume until early May of 1795, and from then through mid-October the new equipment cranked out more than 160,000 1795 Flowing Hair dollars. In October, the design gave way to a new Draped Bust dollar, making the Flowing Hair dollar a two-year type coin.